In this review will be taking a look at the gospel music training centre product by here and play. 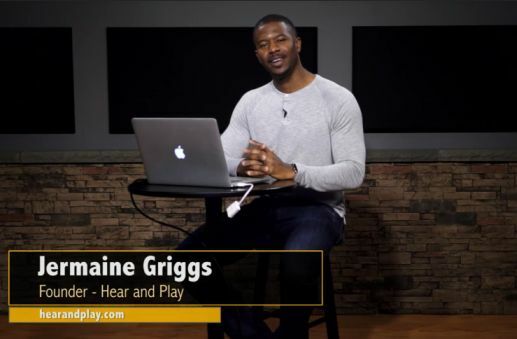 This is a course by Jermaine Griggs and it focuses on a structured training approach for those interested in taking the gospel music playing to the next level. It’s one of the longest-running and largest platforms for learning gospel music. I’ll be dissecting the product, going through its contents, the topic it covers and various courses available inside, then let you know if it’s worth it for you are not to join GMTC. In a hurry? Here below is a video showing you a tour of the GMTC program. Here’s a quick intro to hear and play and Jermaine Griggs if you don’t know about him. The gospel music training centre director. Here’s a quick summary of what you’ll get access to in this training course. 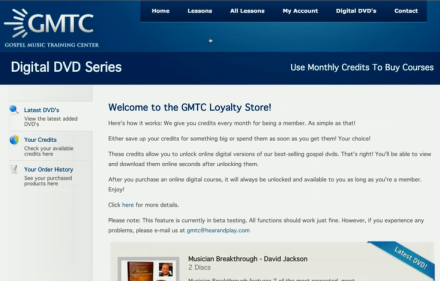 Here are some sample videos from the gospel music training centre video collection. What’s inside the GMTC Members Area? I. 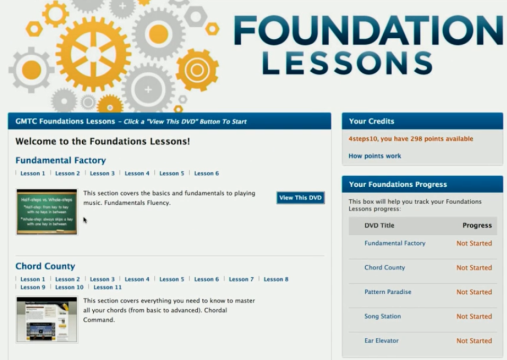 The entry point of the course is the foundation lessons. Weekly song sessions and topical lessons. Extensive catalogue of song place and demos. Dedicated training section for the Organ. Dedicated page for your ongoing lessons, training, downloads. Scheduling calendar live question-and-answer sessions. 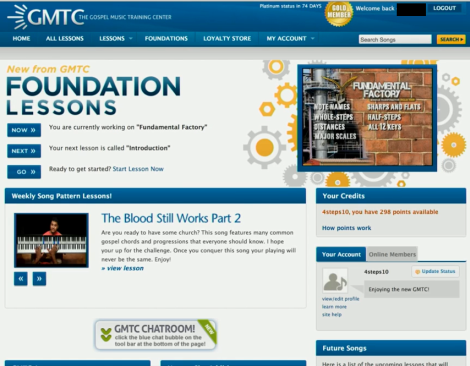 The gospel music training centre point credit system explained. Gospel music training centre loyalty store. Gospel music training centre life support and chat. 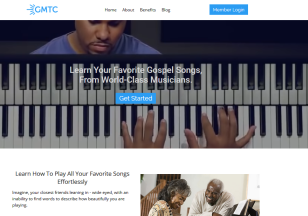 How to get gospel music training center lifetime membership. In conclusion. Is The GMTC for you? Hearandplay.com the domain, was bought and created in the year 2000 by its founder Jermain Griggs and he claims to have helped hundreds of thousands of students learn how to play by ear their favourite instruments like guitars, drums, piano, organs etc learn to play music by simply listening to it. All Jermaine wanted was to help teach aspiring musicians how to learn to play instruments by ear. Today he is happy to have done so judging by the amounts of students that have passed through the hear and play training and the testimonials on his music by ear website as well as on the internet in general. I have reviewed the full suite of products and courses in here and play on this page. You can find out everything you need to know about what it contains there. In this review I’ll be focusing on the gospel music training centre product. Gospel music, a very deep and historical form of music is revered by many across the world. It is especially loved because it’s used to give adoration to the Lord God. The focus is directed by lead instructor Jonathan Powell. Jonathan has been in the here and play music group since 2005 and has been producing multiple products for the program. He was involved in programs like “GospelKeys Master Class” Featuring Michael Bereal, “GospelKeys Ministry Musician” Featuring Jason White, “GospelKeys Organ” Featuring Kevin Nickelson, and the “Musician Breakthrough” Collection. 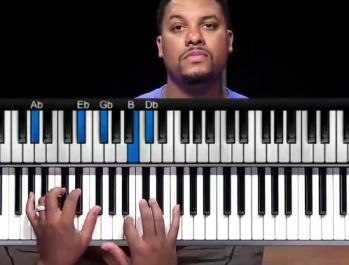 Aside from his work with Jermaine Griggs on the here and play products, he has played professionally in many choirs, churches, with many artists and he is well known for his West Coast slide and Grace note techniques. His passion for teaching is reflected in GMTC. Here is a youtube playlist where you can watch Jonathan showing his talent https://www.youtube.com/playlist?list=PLWraRPpAS0birpdd-hu6xGno6nqO1J_6d. It has been said that gospel music gives joy to God, so if you feel like you have a calling to be a musician in this form of music and you want to realise your full potential, this product is aimed at you to be a one-stop shop for all of your learning needs. You will be joining over 200,000 students and fellow musicians (from beginner to experienced) from over a hundred countries and sharing with them in a wealth of knowledge and experience. You’ll get access to over 9 hours of foundation lessons which give you the core concepts and strategies you will need throughout the course. The course contains over 600 songs, gospel songs, in all of the various 12 keys. There is music dealing in classics, traditional, CCM, contemporary, choir, seasonal as well as many other forms of music. You will be able to download MP3 or MP4 files backing tracks which include drums auxiliaries and bass,, music sheets. You’ll be able to challenge yourself in all 12 key categories of gospel style music while being able to choose the major keys you want to work on. You have access to lessons with interactive quizzes that you can follow along and practice what you learned. Lessons will be released on a drip feed method every week on Mondays. So far there is over 700 hours of training, but audio and video, to seive through. Additionally, you’ll get access to live ongoing training. You will be able to connect with other gospel lovers around the world and conversed with them while you grow your craft. The more you grow, you will be able to earn reward points which gives you VIP access to download other free products. So let’s get into the meat of the review. I will now take you through the member’s area of the gospel music training centre to show you exactly what you get when you signup and login.. Here below is the page that you will meet. This is the page that will greet you. Your specific homepage will be tailored to your level and reflect the latest part of the course you are currently going through. The whole training programme is structured in a way to guide you from beginner level up until advanced. It is specifically made in the way to guide you step-by-step through the lessons and will actually not let you move forward until you’ve completed a specific training and answered correctly the queries at the end. This is the only way you can move forward and it means that your progression is based solely on your ability to understand the core concepts as well as pass a mini test. This part of the course will take you through beginner concepts like notes, scale, chords, patterns, intervals, circular movements, how songs are created, what songs are made of, how to pick up playing by ear et cetera. This is to prevent you having problems later on in the training. 2. Chord County. This section covers all topics related to chords ( Triads, ninths, elevenths, thirteenths etc) from beginner to advanced. It is made up of over 10 lessons which are audio video as well as software. 3. Pattern Paradise. This section covers the pattern. you will learn about the circle of fifths, common movements, pattern proficiency. There are over 9 lessons to learn from here. 4. Song Station. This section teaches you how to play full songs from start to finish. Here you start putting all of your learnt knowledge to work. 5 lessons here. 5. Ear Elevator. In this section you will be trained in how to use your ear to determine and create other enhancements to playing instrument. you get to learn to hear what other instruments are doing and how to create complementary tunes. 4 Lessons here. All of the above lessons are locked and you will be able to move on without finishing the current party are looking at and passing the simple quiz at the end of it. 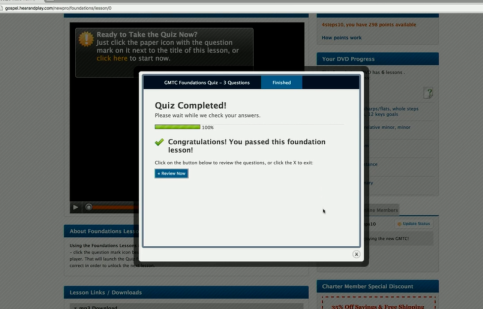 By the end of the training, he should have passed through over 300 quiz questions. This will guarantee that you get the required theory nailed down. Personally I believe this is a wonderful way to keep you accountable and dedicated. Very smart training system. This section contains an ongoing flow of weekly songs you can practice your craft on. It comes with full training and video guides of how to play them as well as chords, backings et cetera. on some weeks, a specific topic may be focused upon and dealt with. 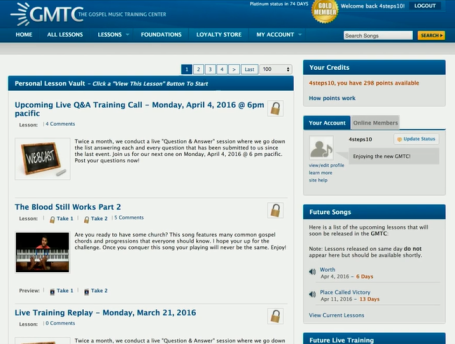 The “all lessons” tab contains all of the weekly lessons ever created in the gospel music training system program. There are literally hundreds of them. tthis section also contains recorded call replays in which Jermaine Griggs as well as the programme director, Jonathan Powell, answers questions sent in by members. You will however need points to access and download them if you wish. The music training lessons a very long, most being over an hour long. Even without the locking the lessons, you can access short preview of the lesson before spending your points. This is a nice system which will ensure you only spend your points on the lessons you want to learn in detail and in depth. Once you get past the fundamentals and start practising live songs, the most valuable part of the whole gospel music training centre are the hundreds of songs available to you to train with. The song plays easy to find and are tagged as well as categorised. So you only have to click on the tags to find all of the lessons and song plays that were similarly tagged. the lessons and songs are also divide by style, contemporary or traditional. They also divided by key. Directed by Kevin Nicholson, there is a full section dedicated to learning to play the organ.This this section also comprises of song place you can practice along with. All of the songs in lessons as well as files you downloaded or unlocked in the past will be stored in your “My lessions, My downloads” so you don’t have to search for them again. There is also a scheduling calendar showing when the next live training and lessons will be scheduled for. You can submit your questions via the form or simply call a specific number. Your questions will be part of the next life question and answer session. It is also possible to call during the live sessions to ask a question. There is a point system in place to enable you to learn in the most efficient way possible. The points and required for special operations like accessing lessons, downloading video/audio, downloading MIDI files for the song tutor Robot or even buying full hear and play courses in the loyalty store. 1. You earn one point every day that you remain a member. He also and another point for every day that you login to your GMTC members area. this is a total of 2 points for every day that you are a member and login. 2. You earn points for commenting (maximum of one point per day)and adding friends to your buddy list. that means that, if you comment on 5 lessons today, you will earn up to 1 point.after 4 hours, you will be eligible to earn another point for comments made there after.the same applies to adding friends (except you will be eligible 48 hours after your last action). 3. You you earn points for remaining the loyal member.Gold members (which requires you to remain a member for 90 days) are granted 90 points on the 90th day. At 180 days,you will become a Platinum member and receive 180 bonus points. At 365 days, you become a diamond member receive an extra 365 bonus points on top of all other points already accommodated throughout the year. The number of points you will be asked to spend when you want to unlock lessons and other files will vary from lesson to lesson. These points can also be used to access all other here and play products (you will need a lot of points for those by the way). Your point will be reset to zero if you cancel or close your membership. This is a store which contains the other products by here and play. In this store, you can use your credits/points accumulated by being a member of the GMTC to buy other popular product by here and play. You will need a lot of points to be able to purchase most of the bigger name products, but is there for you anyway. For example, the “Hear and play guitar 301 advanced licks and tricks” will cost you 500 points. Most of the other products also require hundreds of points to acquire. 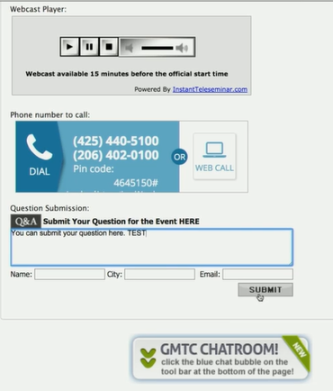 You get access to live support as well as chat where your questions will get a professional answer from the trainers. 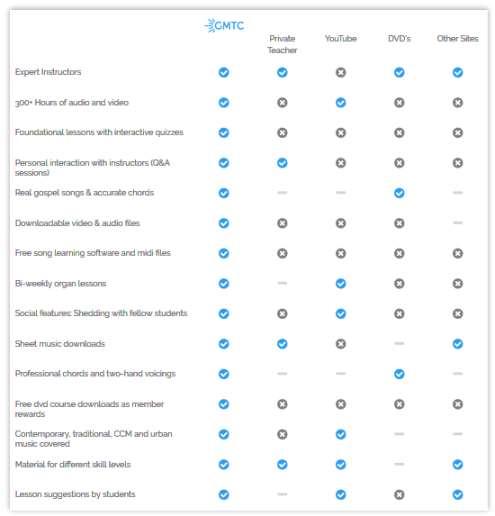 If you want to do away with the points system and get full unlimited access lifetime to all of the subsections, products, downloads and courses in the gospel music training centre, you have the possibility to get in contact with support and make a one-time payment for this privilege. Call the number 1-877-856-4187 Extension 805 and speak to a member of staff regarding the lifetime membership possibility. So having gone through all of the parts of the membership area with you, you can see for yourself how extensive this program really is. The real benefit of joining now is that you get to access a culmintaion of so many years of content and training added on a consistent basis the program. It really is a no-brainer and I recommend it with no reservations. The price of $37 per month is cheap and easily accessible and you can cancel at any time. The course lessons are downloadable so what you’ve downloaded you get to keep. If you feel it’s time to get into a structured course to turn you into a well schooled gospel musician, this is the one you should try out. Obviously, if you dont put in the hard work, dedication and effort needed to see this through, then you wont get success. Just like any other endeavour in life. It’s all up to you. I hope this review helps you decide if this gospel music training centre is for you or not. Fell free to ask me questions in the comments below or share your experience with the program and how it’s going for you. I’ll be very happy to hear from you. As always, I wish you the best in all of your endeavours. Thanks for reading this far and take care.